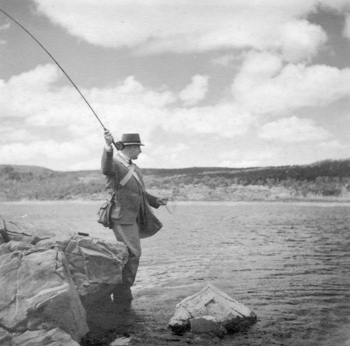 J. Malcolm Gillies (1900-1977) of Victoria was a major creative and commercial influence in Australian fly fishing in the 1930s and early post-war years. Though a Victorian, Gillies was strongly focused on Tasmania. He mainly fished the lakes of the central plateau, encouraged by Launceston car dealer Doug Hollis, for whom he worked from 1925 to 1928. At the onset of the Great Depression, he returned to Melbourne. After making some rods and flies for friends, he decided to make it his full-time work. He set up business from a workroom in his parents’ residence in the grounds of the University of Melbourne, where his Scottish father was a Professor at Ormond Theological Hall. In 1933 he married Jeanne Fawkner of Launceston. J.M. Gillies became a proprietary company after World War II, and shifted emphasis from manufacturing to importing. Malcolm Gillies sold the firm on his retirement to Tasmania in the early 1960s, but as J.M. Gillies Agencies it remains a major player in the fishing tackle business.